Funny, I was just thinking about this. 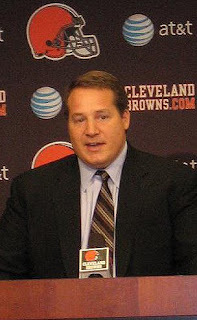 Last night, I was talking to a friend, saying, "Wouldn't it be funny if the Jets turn to Mangini and the Browns to help out for a Cutler trade?" Maybe, but you could say many things about Mangini, but stupid isn't one of them. And having two quarterbacks on his roster only hurts him. Constant speculation hurts his team. If Quinn has a bad day, the "Put in Derek Anderson" chants begin and he has nothing but headaches. In short, it behooves Mangini to get something for one of his QBs and go from there. It makes sense. And Quinn learned under Charley Weis at Notre Dame, so he's schooled in the way Josh McDaniles runs his offense. So it makes a lot of sense for Denver to trade Cutler and get a kid that already knows McDaniles offense and can grow with their new coach in Denver. For the Jets, the trade makes sense as well. Obviously they can use a QB. The only question is do they have enough to get him. Say, Shaun Ellis, Abram Elam and a no. 1 pick for Quinn and maybe a 5th rounder. Then trade Quinn and next year's 1 for Cutler. Would Denver and Cleveland go for this? Would the Jets? Would you? Let's here what you have to say? 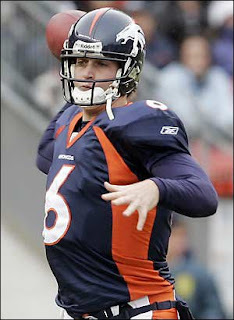 Creative thinking, but Cutler is no sure fire Pro Bowl QB. He's also a bit of a whiner. Other than the cannon arm, I'm not sure that he's more valuable than Brady Quinn. I'd pass on that scenario if I were the Jets. Yeah, I'm with you on the whiner part. But listen to this stat. The kid was 13-4 when Denver held the other team to 20 pts or less. With Rex Ryan's Defense, that means a lot of wins for the Jets. As always, Pete. Appreciate the thought. Are you saying that they would essentially be giving up 2 first round picks for Cutler, plus some players on top of tha? My head is a bit hazy, I might not be reading it right. If, so then that is too much for Cutler. Heck maybe for anyone in the league. I know, Travis, that it is a lot to give up, but like I wrote Pete, he was 13-4 with a good defense. And right now, we have no one, repeat, no one, who can provide us with any hope at all. I dont like the alternatives. Clemens, Ratliff, or do we use our pick on Freeman, and start over? Frankly, I give up a no. 17 pick and another one next year, hopefully, equally as low, and get Cutler.